Knaresborough Town climbed into second place in the NCEL Division One standings courtesy of a 4-1 win over Grimsby Borough, on Saturday. The victory was Town’s third in a week following triumphs over Brigg Town and Westella & Willerby in their previous two outings. It extends their unbeaten run to six matches and leaves them second to leaders Penistone only on goal difference. Saturday’s encounter saw home keeper Jack Rushworth make a good early save to keep out a Jack Debnam shot, but Fraser Lancaster soon broke free at the other end, only to fire wide of the target. Debnam forced Rushworth into another save before Town’s Will Lenehan headed wide from a Tom Hesketh free-kick. Knaresborough eventually went ahead in the third minute of first-half added time. A ball into the penalty area was handled by a Grimsby defender and Hesketh kept his cool to drive home the resulting spot-kick. Just after the break, Brad Walker ran through onto Conor Donoghue’s pass, but fired over, but when Borough stopper Scott Drury parried Walker’s shot in the 48th minute, Donoghue was on hand to slot home the loose ball for 2-0. Hesketh’s free kick then hit the base of a post before Lancaster broke through only to fire wide after opening up his body. Debnam and Jack Bradbury both shot wide as Grimsby committed more men forward, but when Drury saved another Walker cross-shot, Blaine Hobson was able to keep his shot down from an awkwardly bouncing ball to make it 3-0 in the 64th minute. Steve Cooper shot against the outside of a post for Grimsby and Drury saved well from Hobson before Debnam broke clear to bring Borough back into the game at 3-1 in the 74th minute. 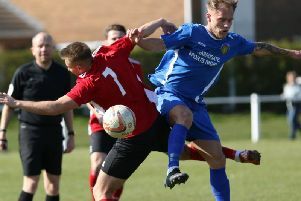 The comeback was stifled a minute later when striker Luke Fanthorpe was sent off for a second bookable offence, reducing the visitors to 10 men. Seb Carole and Lancaster had efforts saved but Lancaster eventually headed home Knaresborough’s fourth as Drury again parried a Hobson shot and Lancaster was first to react to seal victory in the 90th minute.